The 20 World Cup tournaments have been won by eight different national teams. Brazil have won five times, and they are the only team to have played in every tournament. The other World Cup winners are Italy and Germany, with four titles each; Argentina and inaugural winners Uruguay, with two titles each; and England, France and Spain, with one title each. The World Cup is the most widely viewed and followed sporting event in the world, exceeding even the Olympic Games; the cumulative audience of all matches of the 2006 FIFA World Cup was estimated to be 26.29 billion with an estimated 715.1 million people watching the final match, a ninth of the entire population of the planet. The 2014 World Cup took place in Brazil. The next two World Cups will be hosted by Russia in 2018 and Qatar in 2022. Both choices have been criticised in the media; Russia in light of the 2014 Crimean crisis and Qatar for allegations of vote-buying and poor working conditions for foreign workers. The world's first international football match was a challenge match played in Glasgow in 1872 between Scotland and England, which ended in a 0–0 draw. The first international tournament, the inaugural edition of the British Home Championship, took place in 1884. As football grew in popularity in other parts of the world at the turn of the 20th century, it was held as a demonstration sport with no medals awarded at the 1900 and 1904 Summer Olympics (however, the IOC has retroactively upgraded their status to official events), and at the 1906 Intercalated Games. After FIFA was founded in 1904, it tried to arrange an international football tournament between nations outside the Olympic framework in Switzerland in 1906. These were very early days for international football, and the official history of FIFA describes the competition as having been a failure. At the 1908 Summer Olympics in London, football became an official competition. Planned by The Football Association (FA), England's football governing body, the event was for amateur players only and was regarded suspiciously as a show rather than a competition. Great Britain (represented by the England national amateur football team) won the gold medals. They repeated the feat in 1912 in Stockholm. With the Olympic event continuing to be contested only between amateur teams, Sir Thomas Lipton Trophy tournament in Turin in 1909. The Lipton tournament was a championship between individual clubs (not national teams) from different nations, each one of which represented an entire nation. The competition is sometimes described as The First World Cup, and featured the most prestigious professional club sides from Italy, Germany and Switzerland, but the FA of England refused to be associated with the competition and declined the offer to send a professional team. Lipton invited West Auckland, an amateur side from County Durham, to represent England instead. West Auckland won the tournament and returned in 1911 to successfully defend their title. In 1914, FIFA agreed to recognise the Olympic tournament as a "world football championship for amateurs", and took responsibility for managing the event. This paved the way for the world's first intercontinental football competition, at the 1920 Summer Olympics, contested by Egypt and 13 European teams, and won by Belgium. Uruguay won the next two Olympic football tournaments in 1924 and 1928. Those were also the first two open world championships, as 1924 was the start of FIFA's professional era. Due to the success of the Olympic football tournaments, FIFA, with President Jules Rimet as the driving force, again started looking at staging its own international tournament outside of the Olympics. On 28 May 1928, the FIFA Congress in Amsterdam decided to stage a world championship itself. With Uruguay now two-time official football world champions and to celebrate their centenary of independence in 1930, FIFA named Uruguay as the host country of the inaugural World Cup tournament. The national associations of selected nations were invited to send a team, but the choice of Uruguay as a venue for the competition meant a long and costly trip across the Atlantic Ocean for European sides. Indeed, no European country pledged to send a team until two months before the start of the competition. Rimet eventually persuaded teams from Belgium, France, Romania, and Yugoslavia to make the trip. In total, 13 nations took part: seven from South America, four from Europe and two from North America. The first two World Cup matches took place simultaneously on 13 July 1930, and were won by France and USA, who defeated Mexico 4–1 and Belgium 3–0 respectively. The first goal in World Cup history was scored by Lucien Laurent of France. In the final, Uruguay defeated Argentina 4–2 in front of a crowd of 93,000 people in Montevideo, and in doing so became the first nation to win the World Cup. After the creation of the World Cup, the 1932 Summer Olympics, held in Los Angeles, did not plan to include football as part of the schedule due to the low popularity of the sport in the United States, as American football had been growing in popularity. FIFA and the IOC also disagreed over the status of amateur players, and so football was dropped from the Games. Olympic football returned at the 1936 Summer Olympics, but was now overshadowed by the more prestigious World Cup. The issues facing the early World Cup tournaments were the difficulties of intercontinental travel, and war. Few South American teams were willing to travel to Europe for the 1934 and 1938 tournaments, with Brazil the only South American team to compete in both. The 1942 and 1946 competitions, which Nazi Germany and Brazil sought to host, were cancelled due to World War II and its aftermath. The 1950 World Cup, held in Brazil, was the first to include British participants. British teams withdrew from FIFA in 1920, partly out of unwillingness to play against the countries they had been at war with, and partly as a protest against foreign influence on football, but rejoined in 1946 following FIFA's invitation. The tournament also saw the return of 1930 champions Uruguay, who had boycotted the previous two World Cups. Uruguay won the tournament again after defeating the host nation Brazil, in the match called "Maracanazo" (Portuguese: Maracanaço). In the tournaments between 1934 and 1978, 16 teams competed in each tournament, except in 1938, when Austria was absorbed into Germany after qualifying, leaving the tournament with 15 teams, and in 1950, when India, Scotland, and Turkey withdrew, leaving the tournament with 13 teams. Most of the participating nations were from Europe and South America, with a small minority from North America, Africa, Asia, and Oceania. These teams were usually defeated easily by the European and South American teams. Until 1982, the only teams from outside Europe and South America to advance out of the first round were: USA, semi-finalists in 1930; Cuba, quarter-finalists in 1938; North Korea, quarter-finalists in 1966; and Mexico, quarter-finalists in 1970. The tournament was expanded to 24 teams in 1982, and then to 32 in 1998, also allowing more teams from Africa, Asia and North America to take part. Since then, teams from these regions have enjoyed more success, with several having reached the quarter-finals: Mexico, quarter-finalists in 1986; Cameroon, quarter-finalists in 1990; South Korea, finishing in fourth place in 2002; Senegal, along with USA, both quarter-finalists in 2002; Ghana, quarter-finalists in 2010; and Costa Rica, quarter-finalists in 2014. Nevertheless, European and South American teams continue to dominate, e.g., the quarter-finalists in 1994, 1998, and 2006 were all from Europe or South America and so were the finalists of all tournaments so far. Two hundred teams entered the 2002 FIFA World Cup qualification rounds; 198 nations attempted to qualify for the 2006 FIFA World Cup, while a record 204 countries entered qualification for the 2010 FIFA World Cup. In October 2013, Sepp Blatter spoke of guaranteeing the Caribbean Football Union's region a position in the World Cup. In the 25 October 2013 edition of the FIFA Weekly Blatter wrote that: "From a purely sporting perspective, I would like to see globalisation finally taken seriously, and the African and Asian national associations accorded the status they deserve at the FIFA World Cup. It cannot be that the European and South American confederations lay claim to the majority of the berths at the World Cup." Those two remarks suggested to commentators that Blatter could be putting himself forward for re-election to the FIFA Presidency. Following the magazine's publication, Blatter's would-be opponent for the FIFA Presidency, UEFA President Michel Platini responded that he intended to extend the World Cup to 40 national associations, increasing the number of participants by eight. Platini said that he would allocate an additional berth to UEFA, two to Asia Football Confederation and Confederation of African Football, two shared between CONCACAF and CONMEBOL, and a guaranteed place for the Oceania Football Confederation. Platini was clear about why he wanted to expand the World Cup. He said: "[The World Cup is] not based on the quality of the teams because you don't have the best 32 at the World Cup ... but it's a good compromise. ... It's a political matter so why not have more Africans? The competition is to bring all the people of all the world. If you don't give the possibility to participate, they don't improve." An equivalent tournament for women's football, the FIFA Women's World Cup, was first held in 1991 in China. The women's tournament is smaller in scale and profile than the men's, but is growing; the number of entrants for the 2007 tournament was 120, more than double that of 1991. Football has been included in every Summer Olympic Games except 1896 and 1932. Unlike many other sports, the men's football tournament at the Olympics is not a top-level tournament, and since 1992, an under-23 tournament with each team allowed three over-age players. Women's football made its Olympic debut in 1996, and is contested between full national sides with no age restrictions. The FIFA Confederations Cup is a tournament held one year before the World Cup at the World Cup host nation(s) as a dress rehearsal for the upcoming World Cup. It is contested by the winners of each of the six FIFA confederation championships, along with the FIFA World Cup champion and the host country. FIFA also organises international tournaments for youth football (FIFA U-20 World Cup, FIFA U-17 World Cup, FIFA U-20 Women's World Cup, FIFA U-17 Women's World Cup), club football (FIFA Club World Cup, FIFA Women's Club World Cup), and football variants such as futsal (FIFA Futsal World Cup) and beach soccer (FIFA Beach Soccer World Cup). When the U-20 Women's World Cup is held the year before the Women's World Cup, both tournaments are awarded in a single bidding process. The U-20 tournament serves as a dress rehearsal for the larger competition, the same role as the Confederations Cup plays in the men's game. From 1930 to 1970, the Jules Rimet Trophy was awarded to the World Cup winning team. It was originally simply known as the World Cup or Coupe du Monde, but in 1946 it was renamed after the FIFA president Jules Rimet who set up the first tournament. In 1970, Brazil's third victory in the tournament entitled them to keep the trophy permanently. However, the trophy was stolen in 1983 and has never been recovered, apparently melted down by the thieves. After 1970, a new trophy, known as the FIFA World Cup Trophy, was designed. The experts of FIFA, coming from seven countries, evaluated the 53 presented models, finally opting for the work of the Italian designer Silvio Gazzaniga. The new trophy is 36 cm (14.2 in) high, made of solid 18 carat (75%) gold and weighs 6.175 kg (13.6 lb). The base contains two layers of semi-precious malachite while the bottom side of the trophy bears the engraved year and name of each FIFA World Cup winner since 1974. The description of the trophy by Gazzaniga was: "The lines spring out from the base, rising in spirals, stretching out to receive the world. From the remarkable dynamic tensions of the compact body of the sculpture rise the figures of two athletes at the stirring moment of victory." This new trophy is not awarded to the winning nation permanently. World Cup winners retain the trophy only until the post-match celebration is finished. They are awarded a gold-plated replica rather than the solid gold original immediately afterwards. Currently, all members (players, coaches, and managers) of the top three teams receive medals with an insignia of the World Cup Trophy; winners' (gold), runner-ups' (silver), and third-place (bronze). In the 2002 edition, fourth-place medals were awarded to hosts South Korea. Before the 1978 tournament, medals were only awarded to the eleven players on the pitch at the end of the final and the third-place match. In November 2007, FIFA announced that all members of World Cup-winning squads between 1930 and 1974 were to be retroactively awarded winners' medals. Since the second World Cup in 1934, qualifying tournaments have been held to thin the field for the final tournament. 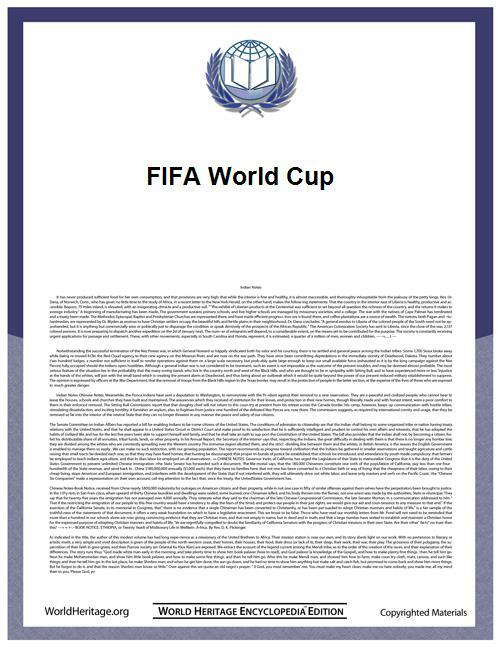 They are held within the six FIFA continental zones (Africa, Asia, North and Central America and Caribbean, South America, Oceania, and Europe), overseen by their respective confederations. For each tournament, FIFA decides the number of places awarded to each of the continental zones beforehand, generally based on the relative strength of the confederations' teams. The qualification process can start as early as almost three years before the final tournament and last over a two-year period. The formats of the qualification tournaments differ between confederations. Usually, one or two places are awarded to winners of intercontinental play-offs. For example, the winner of the Oceanian zone and the fifth-placed team from the Asian zone entered a play-off for a spot in the 2010 World Cup. From the 1938 World Cup onwards, host nations receive automatic qualification to the final tournament. This right was also granted to the defending champions between 1938 and 2002, but was withdrawn from the 2006 FIFA World Cup onward, requiring the champions to qualify. Brazil, winners in 2002, were the first defending champions to play qualifying matches. The current final tournament has been used since 1998 and features 32 national teams competing over the course of a month in the host nation(s). There are two stages: the group stage followed by the knockout stage. In the group stage, teams compete within eight groups of four teams each. Eight teams are seeded, including the hosts, with the other seeded teams selected using a formula based on the FIFA World Rankings and/or performances in recent World Cups, and drawn to separate groups. The other teams are assigned to different "pots", usually based on geographical criteria, and teams in each pot are drawn at random to the eight groups. Since 1998, constraints have been applied to the draw to ensure that no group contains more than two European teams or more than one team from any other confederation. Each group plays a round-robin tournament, in which each team is scheduled for three matches against other teams in the same group. This means that a total of six matches are played within a group. The last round of matches of each group is scheduled at the same time to preserve fairness among all four teams. The top two teams from each group advance to the knockout stage. Points are used to rank the teams within a group. Since 1994, three points have been awarded for a win, one for a draw and none for a loss (before, winners received two points). The knockout stage is a single-elimination tournament in which teams play each other in one-off matches, with extra time and penalty shootouts used to decide the winner if necessary. It begins with the round of 16 (or the second round) in which the winner of each group plays against the runner-up of another group. This is followed by the quarter-finals, the semi-finals, the third-place match (contested by the losing semi-finalists), and the final. Early World Cups were given to countries at meetings of FIFA's congress. The locations were controversial because South America and Europe were by far the two centres of strength in football and travel between them required three weeks by boat. 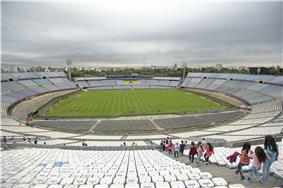 The decision to hold the first World Cup in Uruguay, for example, led to only four European nations competing. The next two World Cups were both held in Europe. The decision to hold the second of these in France was disputed, as the South American countries understood that the location would alternate between the two continents. Both Argentina and Uruguay thus boycotted the 1938 FIFA World Cup. Since the 1958 FIFA World Cup, to avoid future boycotts or controversy, FIFA began a pattern of alternating the hosts between the Americas and Europe, which continued until the 1998 FIFA World Cup. The 2002 FIFA World Cup, hosted jointly by South Korea and Japan, was the first one held in Asia, and the only tournament with multiple hosts. South Africa became the first African nation to host the World Cup in 2010. The 2014 FIFA World Cup is hosted by Brazil, the first held in South America since Argentina 1978, and is the first occasion where consecutive World Cups are held outside Europe. The host country is now chosen in a vote by FIFA's Executive Committee. This is done under an exhaustive ballot system. The national football association of a country desiring to host the event receives a "Hosting Agreement" from FIFA, which explains the steps and requirements that are expected from a strong bid. The bidding association also receives a form, the submission of which represents the official confirmation of the candidacy. After this, a FIFA designated group of inspectors visit the country to identify that the country meets the requirements needed to host the event and a report on the country is produced. The decision on who will host the World Cup is usually made six or seven years in advance of the tournament. However, there have been occasions where the hosts of multiple future tournaments were announced at the same time, as was the case for the 2018 and 2022 World Cups, which were awarded to Russia and Qatar respectively. For the 2010 and 2014 World Cups, the final tournament is rotated between confederations, allowing only countries from the chosen confederation (Africa in 2010, South America in 2014) to bid to host the tournament. The rotation policy was introduced after the controversy surrounding Germany's victory over South Africa in the vote to host the 2006 tournament. However, the policy of continental rotation will not continue beyond 2014, so any country, except those belonging to confederations that hosted the two preceding tournaments, can apply as hosts for World Cups starting from 2018. This is partly to avoid a similar scenario to the bidding process for the 2014 tournament, where Brazil was the only official bidder. On 4 June 2015 Chuck Blazer while co-operating with the FBI and the Swiss authorities admitted that he and the other members of FIFA's executive committee were bribed in order to promote the South African, 1998 and 2010 World Cups. Six of the eight champions have won one of their titles while playing in their own homeland, the exceptions being Brazil, who finished as runners-up after losing the deciding match on home soil in 1950 and lost their semifinal against Germany in 2014, and Spain, which reached the second round on home soil in 1982. England (1966) and France (1998) won their only titles while playing as host nations. Uruguay (1930), Italy (1934) and Argentina (1978) won their first titles as host nations but have gone on to win again, while Germany (1974) won their second title on home soil. Other nations have also been successful when hosting the tournament. Switzerland (quarter-finals 1954), Sweden (runners-up in 1958), Chile (third place in 1962), South Korea (fourth place in 2002), and Mexico (quarter-finals in 1970 and 1986) all have their best results when serving as hosts. So far, South Africa (2010) was the only host nation to fail to advance beyond the first round. The best-attended single match, shown in the last two columns, has been the final in only about half of the twenty World Cup series so far. Another match or matches drew more attendance than the final in 1938, 1954, 1966–1982, 1990 and 2006. The World Cup was first televised in 1954 and is now the most widely viewed and followed sporting event in the world, exceeding even the Olympic Games. The cumulative audience of all matches of the 2006 World Cup is estimated to be 26.29 billion. 715.1 million individuals watched the final match of this tournament (a ninth of the entire population of the planet). The 2006 World Cup draw, which decided the distribution of teams into groups, was watched by 300 million viewers. The World Cup attracts many sponsors such as Coca-Cola, McDonalds and Adidas. For these companies and many more, being a sponsor strongly impacts their global brands. Host countries typically experience a multimillion-dollar revenue increase from the month-long event. 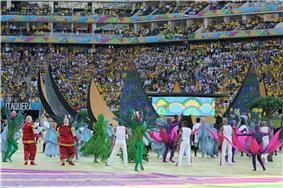 It is predicted that Brazil will bring in more than $11 billion in revenue for the 2014 World Cup. Each FIFA World Cup since 1966 has its own mascot or logo. World Cup Willie, the mascot for the 1966 competition, was the first World Cup mascot. Recent World Cups have also featured official match balls specially designed for each World Cup. ^ There was no official World Cup Third Place match in 1930; The United States and Yugoslavia lost in the semi-finals. FIFA now recognises the United States as the third-placed team and Yugoslavia as the fourth-placed team, using the overall records of the teams in the tournament. ^ Austria withdrew after the draw as a result of the Anschluss with Germany: some Austrian players subsequently joined the German squad, leaving the tournament with 15 teams. ^ a b There was no official World Cup final match in 1950. The tournament winner was decided by a final round-robin group contested by four teams (Uruguay, Brazil, Sweden, and Spain). Coincidentally, one of the last two matches of the tournament pitted the two top ranked teams against each other, with Uruguay's 2–1 victory over Brazil thus often being considered as the de facto final of the 1950 World Cup. Likewise, the game between the lowest ranked teams, played at the same time as Uruguay vs Brazil, can be considered equal to a Third Place match, with Sweden's 3–1 victory over Spain ensuring that they finished third. ^ Only 13 teams played the 1950 FIFA World Cup. 16 teams entered the seeding groups draw. However, Turkey and Scotland both withdrew before the draw; France (eliminated in qualifying) was invited as a replacement, leaving the tournament to be held with 15 teams. After the draw, India and France both withdrew, so only 13 teams participated in the tournament. With five titles, Brazil are the most successful World Cup team and also the only nation to have played in every World Cup (20) to date. Italy (1934 and 1938) and Brazil (1958 and 1962) are the only nations to have won consecutive titles. West Germany (1982–1990) and Brazil (1994–2002) are the only nations to appear in three consecutive World Cup finals. Germany has made the most top-four finishes (13), medals (12), as well as the most finals (8). To date, the final of the World Cup has only been contested by teams from the UEFA (Europe) and CONMEBOL (South America) confederations. European nations have won 11 titles; South American teams have won nine. Only two teams from outside these two continents have ever reached the semi-finals of the competition: USA (North, Central America and Caribbean) in 1930 and South Korea (Asia) in 2002. The best result of an African team is reaching the quarter-finals: Cameroon in 1990, Senegal in 2002 and Ghana in 2010. Only one Oceanian qualifier, Australia in 2006, has advanced to the second round. Brazil, Argentina, Spain and Germany are the only teams to win a World Cup outside their continental confederation; Brazil came out victorious in Europe (1958), North America (1970 and 1994) and Asia (2002), Argentina won a North American World Cup in 1986, while Spain won an African World Cup in 2010. Germany was the first European team to win in South America in 2014. Only on four occasions have consecutive World Cups been won by teams from the same continent – Italy and Brazil successfully defended their titles in 1938 and 1962 respectively, while Spain's 2010 and Germany's 2014 triumphs followed Italy's in 2006. An All-Star Team consisting of the best players of the tournament has also been announced for each tournament since 1998. Two players share the record for playing in the most World Cups; Mexico's Antonio Carbajal (1950–1966) and Germany's Lothar Matthäus (1982–1998) both played in five tournaments. Matthäus has played the most World Cup matches overall, with 25 appearances. Brazil's Djalma Santos (1954–1962), West Germany's Franz Beckenbauer (1966–1974) and Germany's Philipp Lahm (2006–2014) are the only players to be named to three Finals All-Star Teams. Miroslav Klose of Germany (2002–2014) is the all-time top scorer at the finals, with 16 goals. He broke Ronaldo of Brazil's record of 15 goals (1998–2006) during 2014 semi-final match against Brazil. West Germany's Gerd Müller (1970–1974) is third, with 14 goals. The fourth placed goalscorer, France's Just Fontaine, holds the record for the most goals scored in a single World Cup; all his 13 goals were scored in the 1958 tournament. In November 2007, FIFA announced that all members of World Cup-winning squads between 1930 and 1974 were to be retroactively awarded winners' medals. This made Brazil's Pelé the only player to have won three World Cup winners' medals (1958, 1962, and 1970, although he did not play in the 1962 final due to injury), with 20 other players who have won two winners' medals. Seven players have collected all three types of World Cup medals (winners', runner- ups', and third-place); five players were from West Germany's squad of 1966–1974 including Franz Beckenbauer, Jürgen Grabowski, Horst-Dieter Höttges, Sepp Maier and Wolfgang Overath (1966–1974), Italy's Franco Baresi (1982, 1990, 1994) and the most recent has been Miroslav Klose of Germany (2002–2014) with four consecutive medals. Brazil's Mário Zagallo and West Germany's Franz Beckenbauer are the only people to date to win the World Cup as both player and head coach. Zagallo won in 1958 and 1962 as a player and in 1970 as head coach. Beckenbauer won in 1974 as captain and in 1990 as head coach. Italy's Vittorio Pozzo is the only head coach to ever win two World Cups (1934 and 1938). All World Cup winning head coaches were natives of the country they coached to victory. Among the national teams, Germany has played the most World Cup matches (106) and appeared in the most finals (8), semi-finals (13), quarter-finals (16) as well as scoring the most World Cup goals (224), while Brazil has appeared in the most World Cups (20). The two teams have played each other twice in the World Cup, in the 2002 final and in the 2014 semi-final. ^ Tom Dunmore, Historical Dictionary of Soccer, page 235, quote "The World Cup is now the most-watched sporting event in the world on television, above even the Olympic Games." ^ Stephen Dobson and John Goddard, The Economics of Football, page 407, quote "The World Cup is the most widely viewed sporting event in the world: the estimated cumulative television audience for the 2006 World Cup in Germany was 26.2 billion, an average of 409 million viewers per match." ^ Glenn M. Wong, The Comprehensive Guide to Careers in Sports, page 144, quote "The World Cup is the most-watched sporting event in the world. In 2006, more than 30 billion viewers in 214 countries watched the World Cup on television, and more than 3.3 million spectators attended the 64 matches of the tournament." ^ a b FIFA considers that the national team of Russia succeeds the USSR, the national team of Serbia succeeds the Yugoslavia/Serbia and Montenegro, and the national team of Czech Republic succeeds the Czechoslovakia. ( ; ; ). ^ Australia's qualification in 2006 was through the Oceanian zone as they were a member of the OFC member during qualifying. However, on 1 January 2006, they left the Oceania Football Confederation and joined the Asian Football Confederation. ^ The 1982 edition in Spain had a format with a second round consisting of 12 teams instead of 16, 4 of which qualified to the semi-finals. 1962: "El Rock del Mundial"
1966: "World Cup Willie (Where in this World are We Going)"
1998: "The Cup of Life"
2010: "Waka Waka (This Time for Africa)"
2014: "We Are One (Ole Ola)"